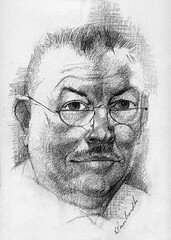 Siegfried Reinhardt's sketched portrait of Harris Armstrong. The approximate date of the portrait is 1960. Reinhardt was a noted painter and educator in Saint Louis, Missouri. He taught painting at the School of Art at Washington University in Saint Louis. His work combined realism with elements of surrealism and what woud later be called super-realism. In his most well-known Reinhardt created large scale murals depicting various groups and organizations. In some cases, Reinhardt and Armstrong collaborated on architectural projects that featured murals.